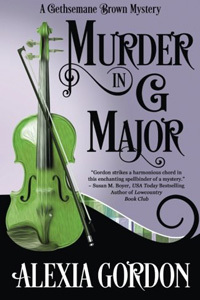 Murder in G Major by Alexia Gordon: Synopsis and Online Purchase Options. Synopsis (from the publisher): With few other options, African-American classical musician Gethsemane Brown accepts a less-than-ideal position turning a group of rowdy schoolboys into an award-winning orchestra. Stranded without luggage or money in the Irish countryside, she figures any job is better than none. The perk? Housesitting a lovely cliffside cottage. The catch? The ghost of the cottage's murdered owner haunts the place. Falsely accused of killing his wife (and himself), he begs Gethsemane to clear his name so he can rest in peace. Gethsemane's reluctant investigation provokes a dormant killer and she soon finds herself in grave danger. As Gethsemane races to prevent a deadly encore, will she uncover the truth or star in her own farewell performance?